This month's update includes transcriptions of records compiled by Rollin H Cooke and deposited at the Berkshire Athenaeum in Pittsfield, Massachusetts. The records were researched during the recent visit to Westfield for the Sackett family reunion. The transcriptions include records of descendants of some female lines not previously noted in Sackett records. The addition of a Website tour is in response to a request at the reunion from Anne Murray for a talk on the website. Time did not allow this, but it is hoped that the addition of the new feature will be helpful in explaining the website's scope. The Transactions page is introduced to provide a chronological listing of the activities of the Association, including records of Committee and Association meetings, reports of reunions, and an archive of the newsletters which were published each quarter from 2003 to 2009. After the newsletter ceased publication and was no longer a current activity, the files were archived in the Members' Only area of the website. That separate password-controlled area is no longer seen as necessary and is discontinued. The Newsletters and Committee records are now available under Transactions on the public pages. I would be pleased to add more pictures to the Westfield 2012 reunion gallery if others who attended have photographs in their cameras that would fill gaps in the record. We spoke at the Reunion about the Newspaper research project. Peg Eddy has made a start on some extracts. There is plenty to do if others would like to contribute. The new page for recent additions will, it is hoped, make it easier for readers to keep abreast of items being added to the archive, and may also provide a spur to progress with the project. The page will show items added in recent months on a rolling basis. 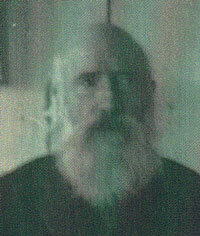 The Samuel Arthur Sackett memoir was contributed to the mailing list in 2000 by Denzil Klippel. I came across it again in Thurmon King's database when compiling new member Byra Sackett's ancestry. This vivid memoir, as recorded by Samuel's daughter Julia in 1930, now appears in the History & Memoirs section of the website. Also in History & Memoirs is Jean Carpenter's fascinating account of the surprise in store for her when she set about researching her great-grandfathers who had served in the Civil War. A great read! 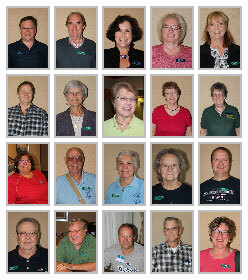 Twenty members of the Sackett Family Association gathered recently in Westfield, Massachusetts, for the 2012 reunion. Convenors Debbie Barbee and Sharon Powalka had arranged a busy and most interesting package of events, including guest speakers, visits to places of Sackett interest, research trips, a genealogy forum, business meeting, and reunion dinner. Best of all was the opportunity to meet and share with family, and full advantage was taken of various social events to visit with old friends and make new ones. 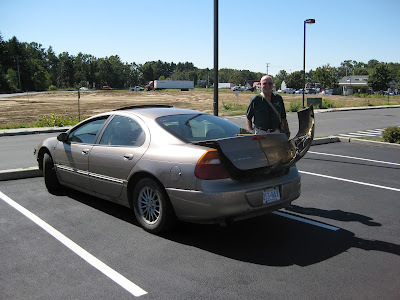 An early arrival at the Westfield 2012 Sackett reunion was Mike Sackett, seen here after bravely fighting off unseen attackers on the highway. Despite losing a large part of the front of his car in the attack, the quick-thinking Sackett, determined to miss none of the reunion's exciting events, tore off the damaged front with his bare hands, stuffed it in the trunk, and completed his journey undaunted and on time. Are you going to Westfield 2012? Richard & Sharon Powalka of North Granby, Connecticut. Steve & Debbie Barbee of Dover Plains, New York. Jean Carpenter of Fairfax, Virginia—"I plan to be there at least for the core dates – probably longer." Chris Sackett of Guernsey—"This sounds like one not to be missed! My dates are Wed 19 to Tue 25." Molly Sackett and family live locally (Holyoke) and will attend as much as they can. Patty Sackett Chrisman of Maplewood, New Jersey—"I plan to attend and may have three others with me." Don & Glenna Hertzler of Weatherford, Oklahoma. Julianne DuBois of Washington, DC, & family are probables. John & Terri Sackett of Mount Holly, New Jersey. Anne Murray of Port Angeles, Washington State. Mike J Sackett & Mary Volberding. Liesa Robarge of Big Pine Key, Florida. Mary Lou Petrie of Covina, California, is hoping to attend. Kate Visser of South Carolina has made hotel reservations—"I'm so looking forward to it." Michelle Pandolfi of Wilbraham, Massachusetts. 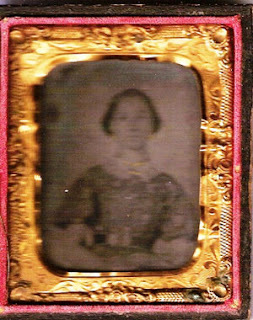 Lorraine Bell of New York. Cliff McCarthy of Belchertown, Massachusetts. Kathleen Logan of Sewell, New Jersey, and her sister Margaret "Peg" Eddy of Burlington, Vermont, are staying Wed 19 to Sun 23. Gene & Marianne Theroux of Southwick, Massachusetts. Ron & Kathleen Normandeau of Polson, Montana. Thurmon King of Pasco, Washington State. Terri Carlson of Lake Arrowhead, California. Chuck & Heather Sackett of New Hampshire. Steve & Lana Sackett of Louisiana. Charles, Janice, & Terry Sackett of New Hampshire. Reunion convenors Debbie Barbee and Sharon Powalka announce a packed and entertaining program of events for the Sackett Family Reunion to be held in Westfield, Massachusetts, in September. There will be talks, tours, much Sackett history, and visiting with cousins and Sackett researchers. Sackett reunions just keep getting better—and this one promises to be the best yet! Leave a Comment to add your name or travel plans. Posted 29 May 2012. Updated 27 August 2012. Many thanks to Association member Anne Murray who has supplied biographical sketches of her grandmother Florence Russell and great-grandmother Flora Sackett. Other members may be inspired to follow Anne's lead and add their contribution to the Sackett story by remembering one of their ancestors. Thanks, too, to new member Darrin Lettinga who has provided a set of family photographs, published here as the Ashal Tyler Sackett gallery. Glenn Sackett's DNA test results place him and his earliest known ancestor Warren J Sackett (c1794–1851) in the same line as Simon Sackett the colonist (the Thanet, Kent, line). The search is on to identify Warren's parents. Thurmon King's database has grown to contain records of 37,154 people (29,823 online) and has an ever-growing amount of data on individuals, as well as more photographs supplied by members. Pages from Vincent Eli John Sackett's bible were kindly supplied by new member Billie Dale Wakefield. The new Sackett Family Association committee has elected its president and other officers to serve for 2012–13. Following this year's round of elections, Don Hertzler, Sharon Powalka, and Thurmon King have been elected to the Sackett Family Association Committee. They will serve for three years as the class of 2015. The new committee's first task will be to choose among themselves a president, vice president, secretary, and registrar. The search forms may take a few moments to load the first time they are used. Once loaded, the search is fast, and it allows various search parameters, such as the ability to search for people based on the names of spouses or parents. There is a choice of search methods: Basic and Regular Expressions—see the Help item ["?"] on the form for an explanation. 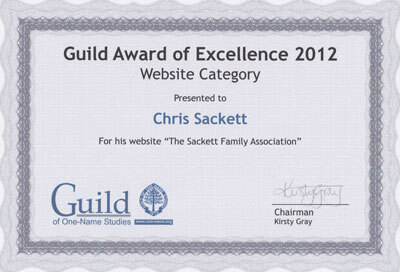 The Sackett Family Association website has received the Guild of One-Name Studies Award of Excellence 2012. Why Westfield, MA, in 2012? In 2010 at the reunion in Portland, Oregon, it was decided that the next reunion would be held in Westfield, MA, since one of its first settlers was John Sackett, who was the son of Simon Sackett who settled Cambridge (Newtown) MA. (Sackett Reunion 2006). There is a great deal of Sackett history in and around Westfield – in some of the neighboring towns such as Southwick, MA, Springfield (settled by Simon’s son Simon, Jr.) and Northampton, MA. From Weygant we learned that John became a resident of Springfield, MA, in 1653. In 1659 he married Abigail Hannum who was from Windsor Connecticut (her father William Hannum is listed as one of the first settlers of Windsor, CT, which is the next town over from Hartford) and lived there a short time until he moved about 15 miles away to Northampton, MA. In 1665, the family moved yet again, this time to Westfield. It seems he moved to Westfield when it became a permanent settlement. King Philip's Indian War occurred in 1675 and John’s house and barn were both destroyed by Indians. You can read about this in Weygant, page 17. 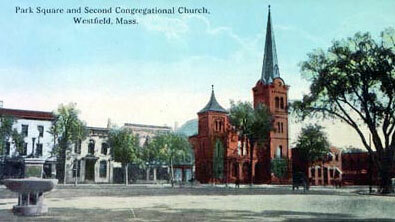 John lived in Westfield until he died in 1719. Abigail Sackett’s grave is one of the oldest ones in the “Old Burying Ground” which is on the register of historic places and is in Westfield. We believe that John is buried next to her, but his headstone is gone. There is a large Sackett section in the Old Burying Ground and that is one of the places that we will be touring during our reunion. The area surrounding Westfield is full of Sackett history and we have an extensive agenda set up to visit the Westfield sites, but there are so many cemeteries, historical sites, museums, and libraries – so much history that you might wish to extend your stay to visit them. Also, Debbie and Steve Barbee would like to invite you to extend your reunion adventure to include Sunday Church Service in Warren, CT, the day after our reunion. John Sackett’s son, William Sackett's line is of interest as his son, Jonathan eventually ended up in Warren, CT. He and his family donated land for a church to be built there. The church, which Debbie and Steve attend, The Warren Congregational Church, is located on Sackett Hill Road. The Cemetery where Jonathan and others of his family are buried is just down the road. A large stone which commemorates the Sackett family is also located there. A drive from the hotel in Westfield would take about 1½ hours. The congregation would love to welcome any of the Sackett family. We hope that you can join us for the reunion and can follow "In Sackett Footsteps" with us. We look forward to reconnecting with and meeting new “cousins”. Co-Conveners of the Sackett Family Reunion 2012. Sergeant John W Sackett's WWII dog-tag, found by Kelly Grace at an old U.S. army base near Brisbane, Australia, has been reunited with John's family in Michigan. Kelly wrote to Sackett Family Association historian Thurmon King who posted her message on the Sackett mailing list. 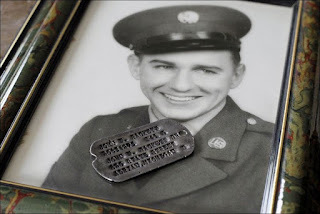 Within hours, Association member Sue Sackett had identified the tag as belonging to her late husband's uncle, who she knew had lived in Adrian, Michigan, during the war. The tag, now a much-treasured reminder of their late father, is in the possession of John Sackett's daughters, Mary Hammond, Pam Thacker, and Kathy Rollison. The full story and pictures appear in the Toledo Blade. John William Sackett's record is in Thurmon King's database. Thanks to Len Sackett who has provided a further batch of family photographs going back to his great-grandfather Arden H Sackett. Thurmon's database continues to grow, both in the amount of detail on individuals and in the numbers of people. There are records of nearly 37,000 people in the database and, after omitting living persons, nearly 30,000 are online. It is time once again for the election of TSFA Members to the Association Committee. Members of the Committee who are retiring are those in the Class of 2012: Patti Hobbs, Kathy James, and Chris Sackett. Newly elected members will serve for three years, forming the Class of 2015. The maximum number of Committee members is 12. We will be looking for up to five new members in this election—four to form the Class of 2015, and one to fill a vacancy in the Class of 2014. According to our Constitution, those wishing to run for a seat on the Committee will submit their names to the Nominating Committee, along with a short biography and statement of qualifications (not to exceed 250 words and not mandatory). It is also possible to nominate someone other than yourself, if you have that person's approval. Names and biographies will be posted on the TSFA Website for members to review. The Nominating Committee will accept candidates until 15 April 2012, at this email address: nominate@sackettfamily.info. Members may cast their secret votes from 16 April 2012 until 30 April 2012, at an email address set up for that specific purpose. Results of the voting will be announced in the first week of May 2012. Members are elected to a seat on the Association Committee, and not to a specific office. The Committee, once installed, will elect the following officers among themselves, to serve in that capacity for one year: President, Vice President, Secretary, and Registrar. Remaining Committee Members will serve as Members at Large. Any organization depends on the participation of its members to remain vibrant and growing. It is important to have new ideas and fresh approaches brought into the mix. You are encouraged to stand for election as a member of the TSFA Committee. This is an excellent way for you to help our organization provide the services that you have found helpful in your genealogical research. In volunteering to stand for election, please send your replies to the Nominating Committee email: nominate@sackettfamily.info. Many thanks to Association members Joan Leary of Havering, Essex, and Leonard A Sackett of Berkley, Michigan, for contributing to the Sackett history. Joan has researched West Ham (Essex, England) Cemetery records. Len has provided family photographs going back to his great-grandfather Arden H Sackett. Added to the website is a historic documents gallery, so far containing London apprenticeship and freeman papers. Contributions to the gallery will be welcome. "The post about the picture of an unidentified person reminded me of a picture I received a while back. 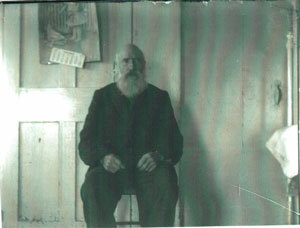 The picture is of a Sipe Sackett taken 3 December 1911 at the Ore Hill Mine near Warren, Grafton Co., New Hampshire. I think that Sipe was a nickname and trying to guess at his age, I haven't come up with who this guy is." Please leave a comment if you think you can identify this mystery Sackett. The website is back online after the recent hacking, and appears to be working normally. Thurmon's database continues to grow. He has added 471 individuals since the last update in November, and has added more data to the records of people already published. Records of 29,555 people are now online.